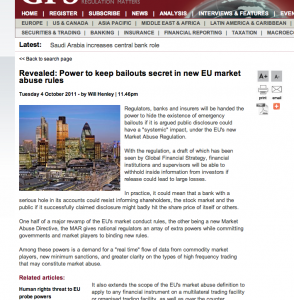 Regulators, banks and insurers will be handed the power to hide the existence of emergency bailouts if it is argued public disclosure could have a “systemic” impact, under the EU’s new Market Abuse Regulation. With the regulation, a draft of which has been seen by Global Financial Strategy, financial institutions and supervisors will be able to withhold inside information from investors if release could lead to large losses. In practice, it could mean that a bank with a serious hole in its accounts could resist informing shareholders, the stock market and the public if it successfully claimed disclosure might badly hit the share price of itself or others. One half of a major revamp of the EU’s market conduct rules, the other being a new Market Abuse Directive, the MAR gives national regulators an array of extra powers while committing governments and market players to binding new rules. Among these powers is a demand for a “real time” flow of data from commodity market players, new minimum sanctions, and greater clarity on the types of high frequency trading that may constitute market abuse. It also extends the scope of the EU’s market abuse definition to apply to any financial instrument on a multilateral trading facility or organised trading facility, as well as over the counter products such as derivatives. By splitting parts of the revised directive into a regulation with “core rules”, the commission hopes to better clamp down on insider trading and market manipulation and ease adoption of the rules into the EU’s planned single rulebook. The regulation places a new onus on issuers to disclose company specific inside information in order to prevent insider trading, but, crucially, says that there are circumstances when public release could be pushed back. “If inside information is of systemic importance and it is in the public interest to delay its publication, the competent authorities will have the power to permit such a delay,” says the draft seen by Global Financial Strategy. The leaked draft specifically cites the example of “where a financial institution is receiving emergency lending assistance”. “[The delay would be] for a limited period in the wider public interest of maintaining the stability of the financial system and avoiding the losses which could result for example from the failure of a systemically important issuer.” However no upper time limit is given. The draft regulation, expected to be published within weeks, was put together by European commission officials following a public consultation on the 2003 Market Abuse Directive in summer 2010. The text dismisses the existing EU market abuse regime as failing to give regulators sufficient information or powers to intervene. Existing rules tolerate sanctions which are “either lacking or insufficiently dissuasive… mean[ing] that regulators cannot effectively enforce the directive,” it adds. Under the proposals put forward, a variety of automated high frequency trading would be deemed to constitute market abuse, including practices known as quote stuffing, layering and spoofing. Mirroring new rules in the US, whistleblowers could receive payoffs by regulatory authorities for divulging information about market abuses, and would be offered protection. The draft regulation also seeks to close an “information gap” identified by the European Commission for spot commodity markets. It demands that regulators are given access to “continuous data” in a specified format. “By gaining access to spot commodity market traders’ systems, competent authorities are also able to monitor real-time data flows,” the draft says. The regulation introduces minimum rules for administrative measures, sanctions and fines. It says a maximum fine for a breach of the regulation should be €5m ($6.6m) or 10 per cent of company turnover or twice the amount of the profit earned. However it does not attempt to introduce maximum harmonisation on standards, explicitly stating that governments have the power to increase them. Forcing market players to repay any profits from market abuse is also explicitly provided for by the regulation. “And, in order to ensure an appropriate deterrent effect, it introduces fines which must exceed any the (sic) profit gained or loss avoided as a result of the violation of the regulation,” the draft says. The draft text also clarifies reporting obligations for the transactions of managers, introducing a new €20,000 threshold and stipulating that any transaction made on behalf of a manager must be reported to national authorities. It continues: “As a result of regulatory, market and technological developments, gaps in the regulation of new markets, platforms and over the counter instruments have emerged. Similarly, these same factors have led to gaps in the regulation of commodities and other related derivatives. “The fact that regulators lack certain information and powers, and that sanctions are either lacking or insufficiently dissuasive, mean that regulators cannot effectively enforce the [Market Abuse] Directive. “Finally, the existence of numerous options and discretions in the MAD, as well as a lack of clarity on certain key concepts, undermines the effectiveness of the directive. A spokesperson for the European Commission declined to comment.